If you think the Supreme Court is a problem now, with blockbuster 5-4 decisions going against faith, family and freedom nearly every year, imagine a 7-2 majority against everything you hold dear, for generations. That is what we face this November. 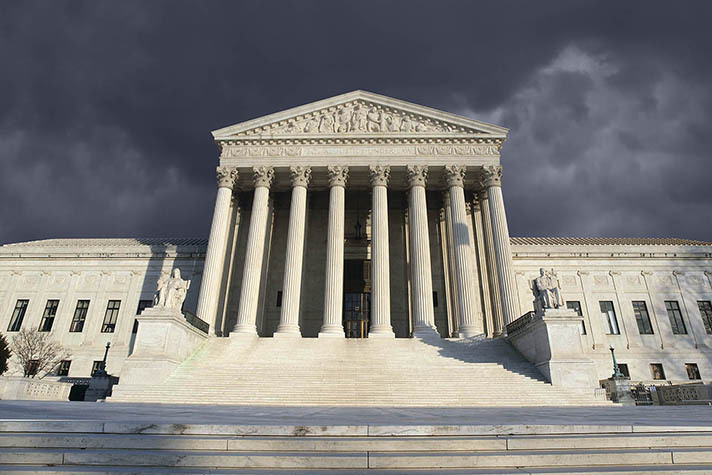 The recent trajectory of the high court has been hostile to Biblical values. In June it even overruled a Texas law designed to make abortion clinics safer for women. The clinics cannot be required by the state, the high court said, to improve sanitation, make room for gurneys, or require their abortion doctors to hold admitting privileges in local hospitals—even though hundreds of Texas women are hospitalized every year after abortions. Why would the Constitution forbid these things? It doesn’t. The Texas law was nullified for no other reason than that a majority of justices who favor quick and easy abortion over women’s safety had the votes to do it. Now, similar laws in other states will be toppled, putting more women at risk, handing more abortion clinics a free pass and ending thousands more innocent lives. The vote on the Texas case was 5-3. Even Justice Scalia couldn’t have saved it. He used to say the court was an “ad-hoc nullification machine” when it came to abortion law. This recent case demonstrates that in spades. The Constitution is silent on abortion, so the people should have final authority on the matter. But in a “raw exercise of power” the court took it from us in Roe v. Wade, the infamous case authored by Justice Harry Blackmun (the blistering “raw exercise” accusation coming from Justice Byron White in dissent). Twenty years after that power grab, in the Casey decision, yet another set of justices mustered the votes to give some of it back, giving the people of Pennsylvania (and by extension the rest of us) the power to regulate abortion around the edges. But in the latest decision, an even newer configuration of justices took it away again: two Clinton appointees, two Obama appointees and one erratic Reagan appointee—Kennedy. On abortion, and so many other issues, rulings are based on partisanship and power. It was never meant to be this way. The most recent Supreme Court photo. Bottom row, L-R: Clarence Thomas; the late Antonin Scalia, who died Feb. 13; Chief Justice John Roberts; Anthony Kennedy; Ruth Bader Ginsburg; top row: Sonia Sotomayor; Stephen Breyer; Samuel Alito; Elena Kagan. There are two competing approaches to what Chief Justice William Rehnquist called “the very delicate responsibility of judicial review.” One is limited, where, as Rehnquist said, judges see their role as interpreting an instrument framed by the people in a detached and objective way. This is the vision of the founders, and why Alexander Hamilton called the judiciary the “least dangerous branch.” Judges are meant to be umpires, as Chief Justice Roberts noted in his confirmation hearings. They simply call the balls and strikes; they are never meant to pick up the bat and swing. The other approach is expansive, where the Supreme Court is seen as the voice and conscience of contemporary society. This is the vision of many on the modern political left, who believe judges should play a particular role in solving society’s problems. It was five adherents to this latter philosophy who recently decided that having abortion clinic safety standards was a societal problem that needed solving. In addition to Justice Scalia’s vacant seat, it is very likely the next president will have more vacancies to fill. By the end of the next president’s term, five justices will be over 70 years old; three will be in their 80s. On the current court, there are four “problem solvers” who vote to advance the liberal political agenda: Ruth Bader Ginsburg, Stephen Breyer, Sonia Sotomayor and Elena Kagan. There are three “umpires”: Clarence Thomas, John Roberts and Samuel Alito. And there is one swing vote, Anthony Kennedy, upon whom all eyes are focused during major cases each term. Kennedy has cast crucial swing votes against the right to life and for gay marriage. Consider the impact of even one change. If one more justice had voted with Thomas in recent years, gay marriage would not have been imposed on the nation (Obergefell v. Hodges) and Obamacare would be a distant memory (NFIB v. Sebelius). And if one more leftist “problem solver” had been on the bench, many more Christian business owners would be paying crippling fines (or closing) in order to follow their religious beliefs (Burwell v. Hobby Lobby), babies would be dying by partial-birth abortion (Gonzales v. Carhart), and the Boy Scouts would be forced to hire gay activist scout leaders (Boy Scouts of America v. Dale)—a policy they later adopted voluntarily. During Barack Obama’s presidency alone, over 50 Supreme Court cases were decided by a 5-4 margin. Latin scholar Jeff Kantor argues that Americans have gotten so used to a closely divided Supreme Court, where wins and losses seem to be handed out to each political faction in rough parity, that we really can’t imagine what an unrestrained, revolution-minded court might do. Fifty years is a long time to cast your memory back to the dramatic liberal activism of the Warren Court, or even the Roe court a decade later, both of which made decisions that involved vast social changes. What vast social changes would such a court make today? Would the court abolish homeschooling (such as in Germany)? Is it hard to imagine that justices who find almost anything in the Constitution could also find that non-government education violates it? Or that children being indoctrinated by religious “bigot” parents are victims of abuse? Or that excluding women from ordination violates the Equal Protection Clause? Or that anti-LGBT “hate speech” is criminally punishable? Think of all the crazy leftist policies cropping up at colleges and universities, and then imagine them being imposed on the nation by a runaway court. These scenarios give us a view of what a high court appointed by a liberal president may do—unrestrained by a conservative bloc. A good guess can be made of what a Clinton Court would look like, and we can imagine what such a court would do. Is a Trump Court as easily imagined? Many commentators argue that it couldn’t be worse than Clinton’s, but I believe more can be said in its favor from a conservative viewpoint. Moreover, Trump has announced a list of judges he said would be his model for future justices, both to replace Scalia and any others who may die or retire. It is a list of smart, experienced and respected jurists. Several are former law clerks to Justice Thomas and Chief Justice Rehnquist. And most important to conservatives, there is no evidence in their records that they decide cases according to their political preferences rather than the law. It is also a campaign promise that, if broken, would severely hamper a reelection run by Trump in 2020. To put out this list and then go in a wholly different direction would be an outrageous betrayal. Trump sought counsel for this list from the Federalist Society and the Heritage Foundation. He did not go to the ACLU or Planned Parenthood or even the left-wing American Bar Association—special interests to which Hillary Clinton would be beholden. 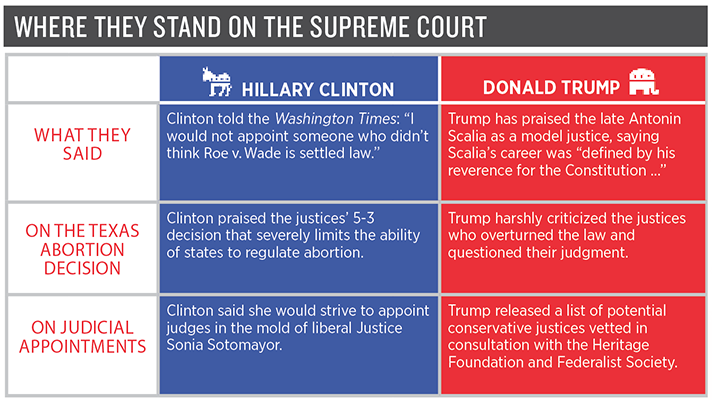 Trump, on the other hand, talked to conservatives about potential high court nominees. In fact, it is likely the same list that would have been compiled by Ted Cruz had he been the party nominee. If you shudder at the thought of what “full federal equality under the law” means to this candidate, your instincts are sound. There are two distinctly different directions the Supreme Court could go—and only one appears to hold any hope that the rights of Christians and other religious people will be protected. As we approach November, it would be tragic if we were to underestimate the threat that a leftist, revolution-minded Supreme Court poses. Cathy Ruse, Esquire, is senior legal fellow at Family Research Council Action, based in Washington, D.C.